I'm one of those people who likes to read inspirational quotes on Pinterest, it's the kind of thing that really gets me thinking, and I enjoy how reflective it makes me. Although I wasn't the biggest fan of Wonder, I did love the precept lessons taught by Mr Browne, and the discussions that were had about them. 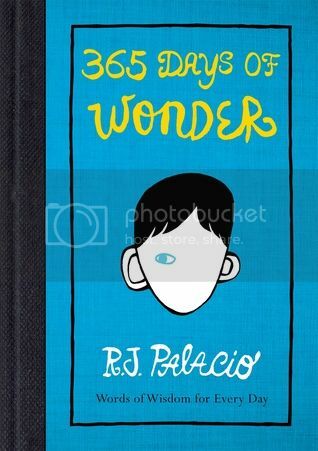 When I discovered that R.J. Palacio had written a book as if written by Mr Browne full of precepts for the whole year, I knew I had to read it. And this book really does give you so much to think about. The book is set up with an introduction from Mr Browne, before going into the precepts, a whole page for each day in the month. After each month, Mr Browne includes an essay about his thoughts on certain precepts, how he came across them, or correspondence he's had with some of his students - characters from Wonder. These sections update us on some thing that have happened since the end of Wonder, or just give another point of view to the year that Wonder spanned. It's really sweet to get these little glimpses back into the world of Wonder, and see the precepts the characters came up with. Life is not measured by the number of breaths you take, but by the moments that take our breath away. - Unknown. The best things in life are not things. - Ginny Moore. The beauty of a living thing is not the atoms that go into it, but the way those atoms are put together. - Carl Sagan. Those who bring sunshine into the lives of others cannot keep it from themselves. - J.M. Barrie. Good friends are like stars. You don't always see them, but you know they're always there. - Unknown. Most sound really nice at first, but then I'd think a little deeper on how they relate to my own life. There were some I agreed with, there were those where my thoughts went a different direction than from the obvious, and there were even those I disagreed with. But there's something to really think about with each one. The book itself made me think so much, that I have decided that next year, should all go well, I will start a 365 Weeks of Wonder blog project, where I make my way through the book discussing each precept in a blog post, with how it made me think and reflect. I've had permission to do this from RHCP, so I'm looking forward to starting it next year. There's one thing about 365 Days of Wonder that, after a while, slightly annoyed me a bit. The precepts focus on "kindness, strength of character, overcoming adversity, or simply doing good in the world," (p3), and, reading it from start to finish in a short period of time, they do begin to get kind of samey. Kindness is the main theme of these precepts, and after a while, different precepts come up repeatedly all seeming to say exactly the same thing about kindness. But then again, this book isn't meant to be read in a short period of time, it's meant to be read every day of the year, one precept at a time. Quite a number of days would go by before coming across a precept that was similar to a previous one if read like that, so I suppose it's not so bad. Of course, for reviewing purposes I read it over a few days, and, as a reflective person, coming over such similar precepts caused me to brush past a few because I've already thought about kindness, and the precepts weren't adding or changing what I had already thought about. It would have been nice if there was a bit more of a change in what the precepts focused on, but kindness is the main focus of Wonder, so it would be for 365 Days of Wonder too. A really fantastic book, one that would make a great gift! I can see parents sitting down and discussing the precepts with their children each day, getting the child to think, and that can only be a good thing. A beautiful book! Thank you to RHCP for the review copy. I really did love this book and I'm planning to start 2015 with reading on of these precepts a day. So glad you like it too!